The idea that climate change undermines and may contribute to the violation of human rights, and that human rights obligations and principles can guide improved international and national climate change policy by focusing attention on the needs of the most vulnerable, is now well established. Yet it was not always so. Back in 2008, when the Maldives first raised the issue of climate change at the Human Rights Council, many States, especially large industrialised economies and emerging economies, objected – arguing that human rights and climate change represent two separate and distinct areas of international law. Two of the main sponsors of these resolutions, namely the Maldives and Switzerland, then pressed for the inclusion of human rights language in the draft UNFCCC climate change agreement then being negotiated at COP15 in Copenhagen. A year later, at COP16 in Cancun, their efforts paid off. The UNFCCC Cancun Agreements (set down in decision 1/COP.16) recalled the work of the Human Rights Council on climate change, but also, most importantly, emphasised ‘that parties should, in all climate change related actions, fully respect human rights.’ This operative paragraph, albeit non-binding, represented an important breakthrough, as it was the first time that human rights were mentioned in an international climate change agreement. The creation of a new UN Special Procedure, the Independent Expert on human rights obligations relating to the enjoyment of a safe, clean, healthy and sustainable environment, in 2012 represented another significant step forward. Upon taking up his mandate, the first Independent Expert, Professor John Knox, began ‘clarifying and elaborating human rights obligations’ relating to the environment. In 2015, at the end of Professor Knox’s first three-year term, the mandate was expanded to become a Special Rapporteur, which responsibility not only for clarifying norms but also operationalizing them. Although the Special Rapporteur mandate has always covered ‘the environment’ generally, he has nonetheless regularly focused in particular on the issue of climate change. In 2015, world leaders took a major step forward in the fight against anthropogenic climate change, when they signed the Paris Agreement under the auspices of the UNFCCC (at COP21). In addition to committing Parties to keeping global temperature increases below 2 degrees Celsius (above pre-industrial levels) and to pursuing efforts to limit them even further to 1.5 degrees, the Paris Agreement also included some human rights language in its preamble. Although preambles do not create rights or obligations under international law, it has been shown that they do guide the interpretation of the core document, and are therefore recognised as customary international law. Moreover, other operative paragraphs in the Paris Agreement do refer to human rights principles and obligations, albeit without explicitly using the words ‘human rights.’ These include, for instance, paragraphs dealing with: gender equality and participation of women, transparency, access to information and public participation, and the rights of indigenous peoples, local communities as well as other vulnerable groups. Interestingly, human rights also played a key role in the inclusion, in the Paris Agreement, of a 1.5 degree target. Paragraph 12 of the Copenhagen Accord, adopted by COP15, had called for ‘assessment of the implementation of this Accord to be completed by 2015, including in light of the Convention’s ultimate objective…including in relation to [the desirability of limiting] temperature rises [to] 1.5 degrees Celsius.’ At COP15 many States, especially developing States, had refused to countenance a target of less then 2 degrees. In order to feed into the consequent scientific review, in early May 2015, the Philippines, on behalf of the Climate Vulnerable Forum (CVF), submitted a report by John Knox and 14 other Special Procedures mandate-holders on the potential implications for global human rights of a 2°C or a 1.5°C increase in global average temperatures. 2018 is expected to see the finalisation of the Paris Agreement implementation guidelines (also known as the ‘Paris Rulebook.’) The Paris Agreement already included some guidance and general principles on how it should be implemented, and refers to the importance of transparency, of building trust among partners, of experience stocktaking, and of the role of financial and technological support, for example. First discussed at COP22 in Marrakech, the implementation guidelines will aim, inter alia, to build on the Paris Agreement text by clarifying who is responsible for which implementing actions, as well as how national climate commitments and actions will be accounted and reported. The ‘Paris Rulebook’ is scheduled to be released in December at COP24 in Katowice. Also in 2018 (September), the Intergovernmental Panel on Climate Change (IPCC) is expected to issue a special report on the ‘impacts of global warming of 1.5 degrees Celsius above pre-industrial levels and related global greenhouse gas emission pathways, in the context of strengthening the global response to the threat of climate change, sustainable development and efforts to eradicate poverty.’ This report was requested by States Parties to the UNFCCC at COP21 in Paris. Last but not least, 2018 is also the year of the launch of the Talanoa Dialogue. This initiative, led by Fiji (the current Chair of the UNFCCC COP), aims to gather ideas, stories and experiences on climate change in order to better inform political actions at future COPs. An online platform has recently been opened, and will receive and display contributions from affected communities and other stakeholders covering three main questions: 1) Where are we today? ; 2) Where do we want to go? ; and 3) How do we get there? By gathering stories and information about the human face of climate change, the Talanoa Dialogue maintains and furthers the original intent and spirit of the Maldives’ original initiative in 2008 – i.e. to place individual people (especially people in vulnerable situations) – their lives, rights and communities – at the centre of international climate change policy. 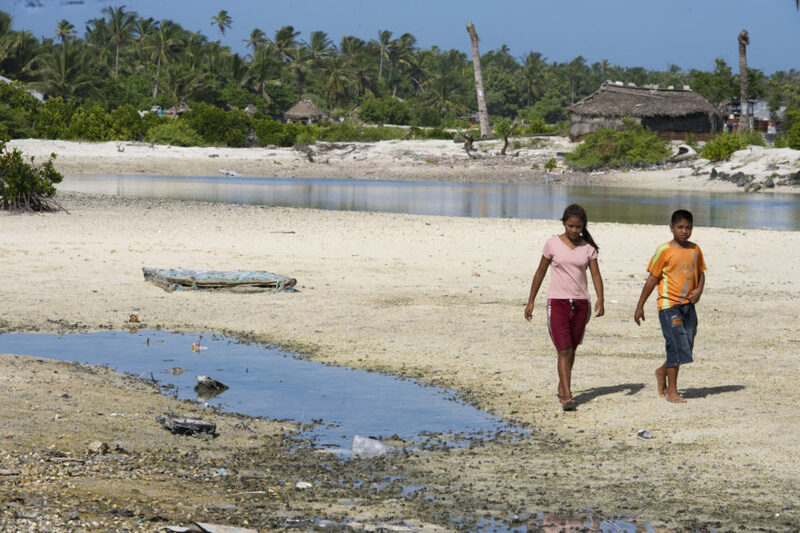 Photo credits: Locals in Tebikenikora, a village in the Pacific island nation of Kiribati which is affected by Climate Change, 4 September 2011, UN Photo/Eskinder, licensed under CC BY-NC-ND 2.0.